This lens marking system is based on our G2-150 modular pad printing system. The purpose of the system is to print registration marks on lenses prior to the grind process. 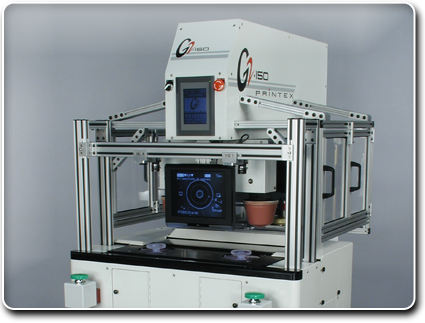 For this application, the G2-150 was outfitted with two independently-actuated print heads and a two-up 115mm inking kit. The print cycle is triggered automatically by the on board intelligent visual inspection system. This system senses the presence of the lenses in the fixture tooling, and in response it activates a vacuum retention device and backlighting for each lens. The print cycle is executed, and then the results are automatically registered by the visual inspection system. The two-up fixture tooling is mounted on a two-position shuttle for conveying the lenses between the load and print stations. An automatic pad tape-off unit is also installed on the system. In production, the lenses to be marked vary greatly in diameter and thickness; the engineering of this system enabled it to accommodate the variations without operator intervention.